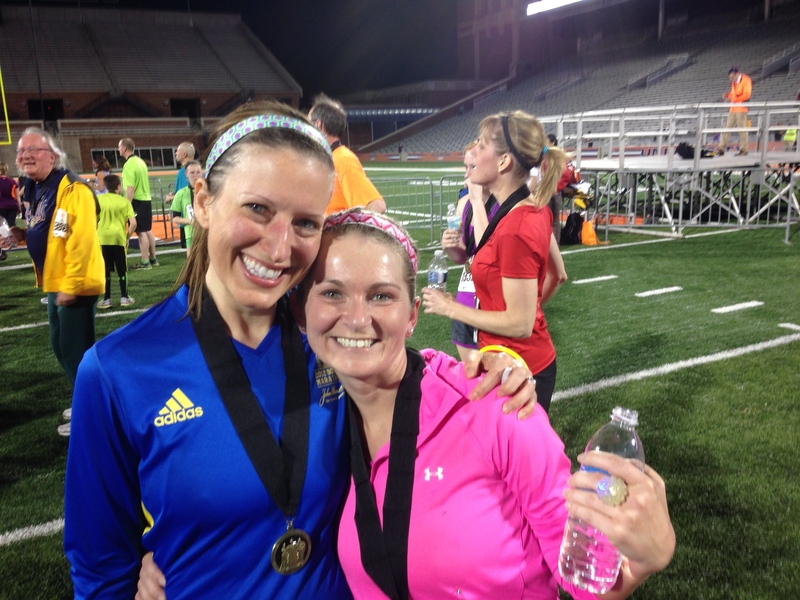 5K Race Takeaway: Helping a friend reach a PR is so much fun! 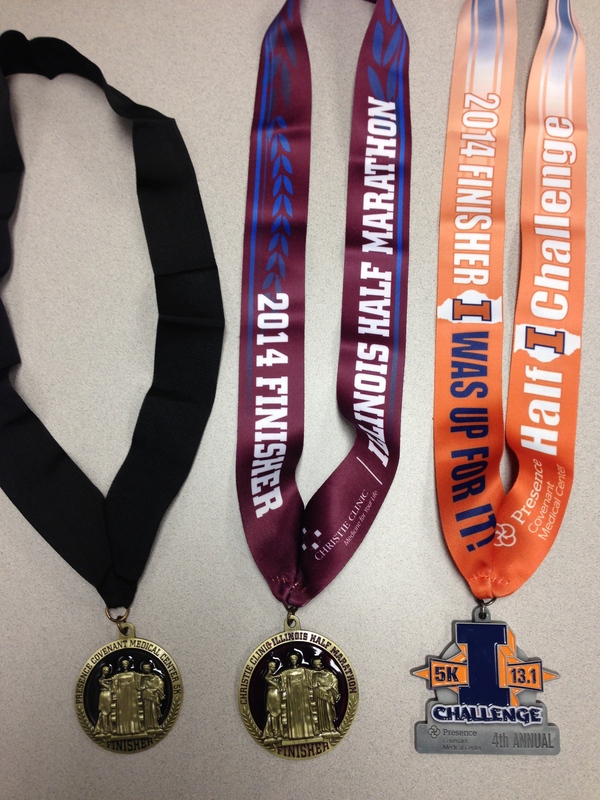 Half Marathon Takeaway: Sometimes it’s just about finishing. 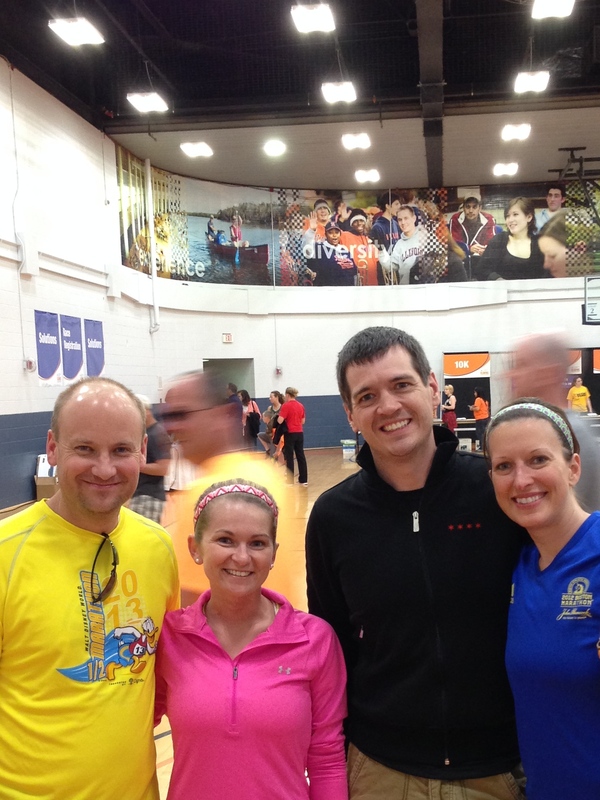 IL Marathon weekend started like usual with picking up our packets and running the 5K the night before. 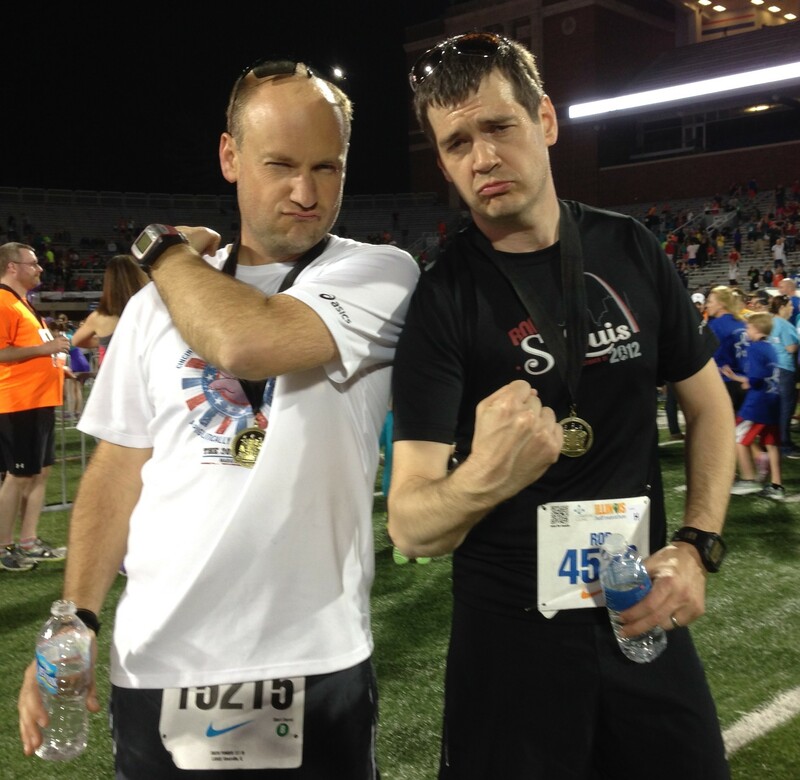 Rob and I would be completing the Half I-Challenge by running the 5K Friday night and the Half Marathon Saturday morning. 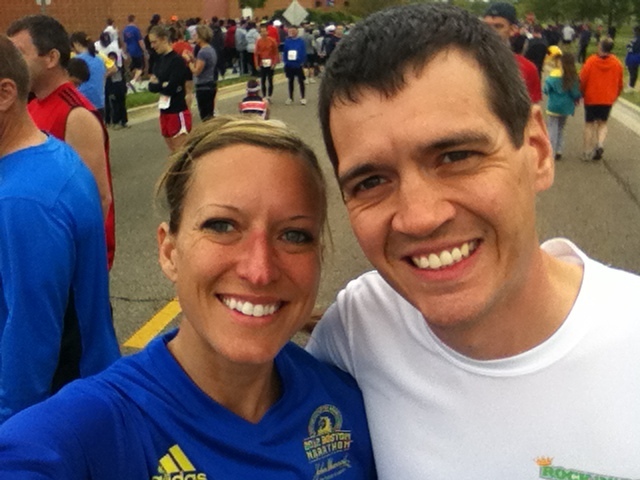 Drew would be doing the Full I-Challenge by running the same 5K and then completing the Full Marathon Saturday. 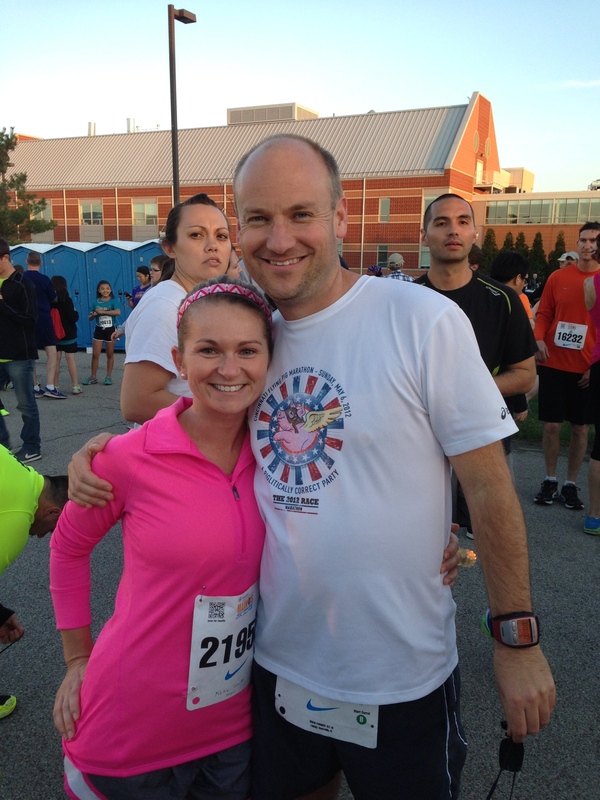 This would be our friend Katie’s second 5K and she was looking to improve her time from her first race. We decided to run together since we were taking it easy and we could help Katie get her PR. Let’s just say this is the closest we have ever done a packet pickup and I was stressed. 🙂 I normally like to be at race events super early, but this was cutting it WAY too close, we were there just 15 minutes before the expo ended. Whew! This year the 5K started on time and we eased our way into the start as the crowd got moving. I talked to Katie when she seemed to need encouragement and I tried to stay quiet when she looked like she was pushing hard and was focused. Rob and Drew ran with us and were enjoying joking around along the way. It was such a fun time running together as a posse. 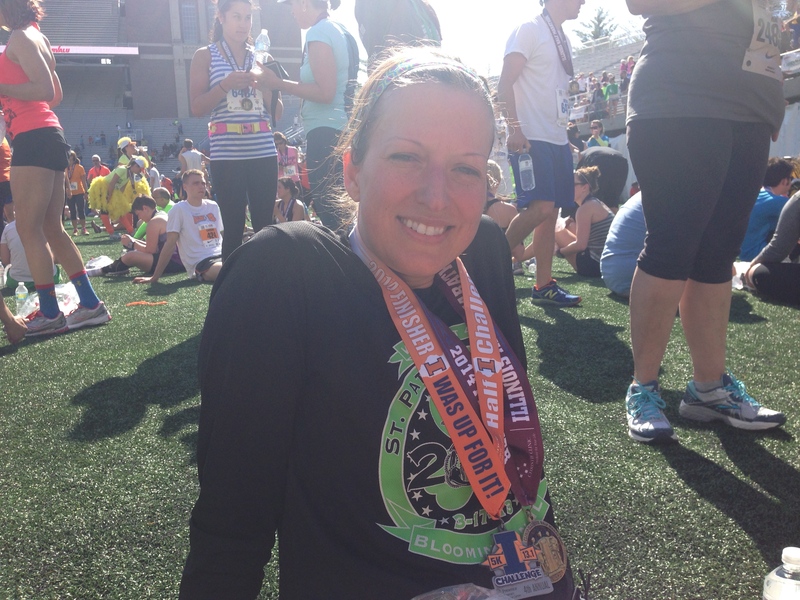 Katie was able to push herself and take 2 minutes off of her time and finished in 36 minutes. Go Katie! 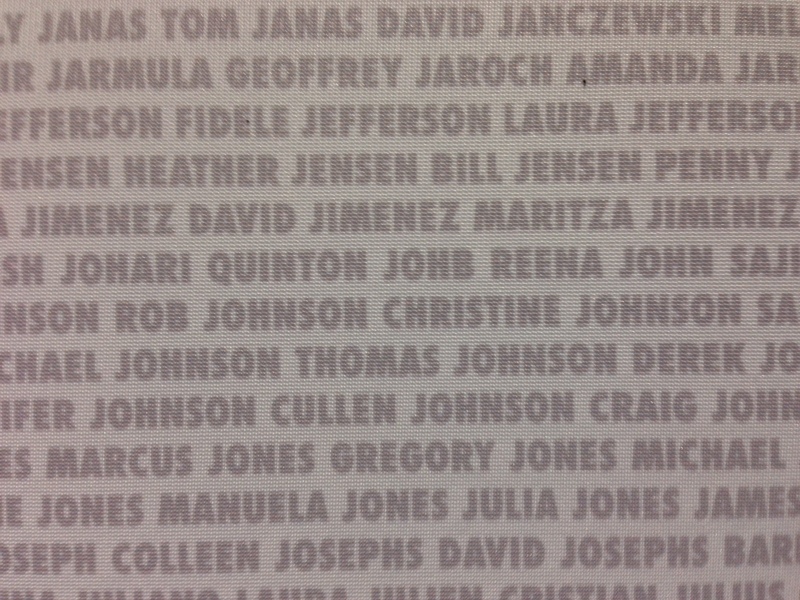 BTW….notice that Rob wore the wrong bib number to the 5K? 🙂 A good lesson learned! Anyone else done that before? Afterward we headed home to get some rest. The weather was gorgeous, 50s, sunny, and it was going to get quite warm. Beautiful if you are running the half, potentially miserable if you were running the full. Yet we stayed optomistic that it would be a good day for everyone. Finally it was time to line up and say bye to Katie. Katie hung out at a nearby Starbucks to see us off. In the past the course has come back on the same road so I thought it would be a good opportunity for Katie to see us again around mile 10. Apparently the course had been updated and that was not the case. Whoops! Katie was able to find the course and see Drew one more time around the halfway point and he was looking good! My race wasn’t going so well. It wasn’t going well from the beginning, which is always a bad sign. The first mile my legs felt dead. Rob was encouraging and said “maybe they will shake out in a couple of miles”. Unfortuantely that never happened. It was just one of those days where I felt like I was dragging my tree trunk legs around. 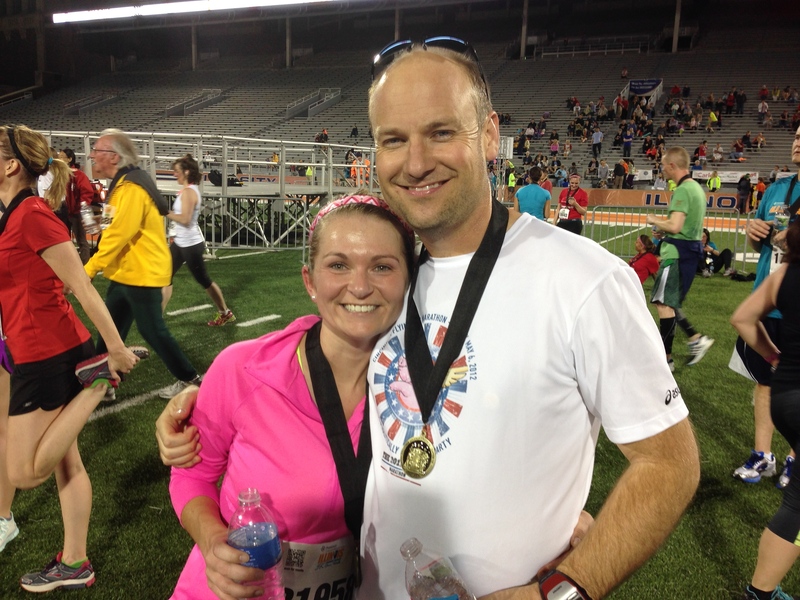 I got to the 10K at 57 minutes. From there things just worse, I was just out of gas and ready to be done. I was off pace and missed my opportunity to be on live TV at mile 10 (info at the bottom of the post). I gave the crew high 5s and trudged on. Around mile 11 Rob was trying to keep me in good spirits and reminding me we were just out to have fun and that we hadn’t been training. I then said “true, and at least I’m not injured, I just have no gas today”. Well those words came back to haunt me at mile 12. I missed seeing a small bump in the road and tripped. One of those slow motion trips and I tried to catch my steps, but after three awkward stumbles I hit the ground on my right hip, scraped both hands and twisted my right ankle. I was flipped over now facing backward, seeing other runners coming up to me asking if I were okay. I laid there saying “go, go, go” and motioning them to keep on running. Rob was said “I’m not leaving you!” and I was like “no, not you, them!”. 🙂 A cop came up and help Rob get me to my feet. I haven’t been injured like this since a training run in 2010. With my injury I plopped down on a couple of bags of ice. I didn’t get our typical finishing pictures. 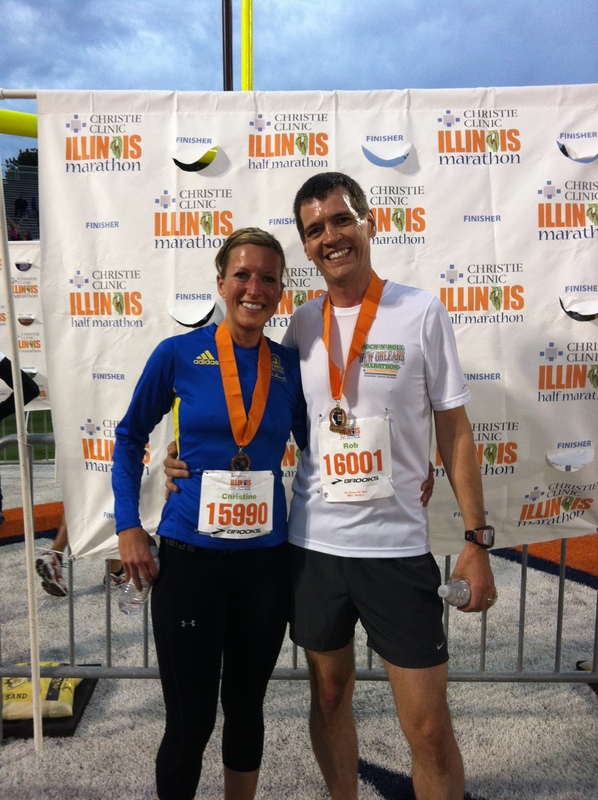 For those that know me or have followed my blog for awhile, you may remember last year that the local news of Champaign, IL, Channel 3, covered my story of running while pregnant. Here’s the interview from last year. They were back to do a follow up story on us now that we have Chase. Here is this year’s interview. 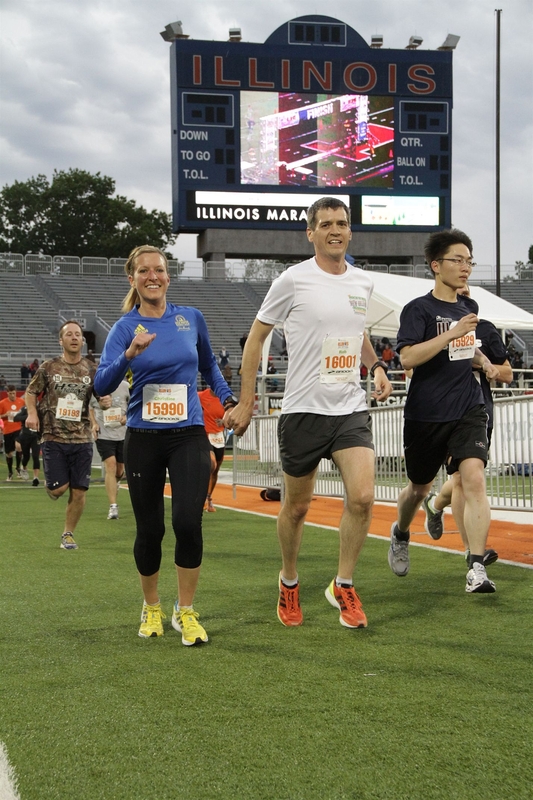 Categories: 5K, Expo, Half Marathon, Illinois Half Marathon, Race | Permalink. 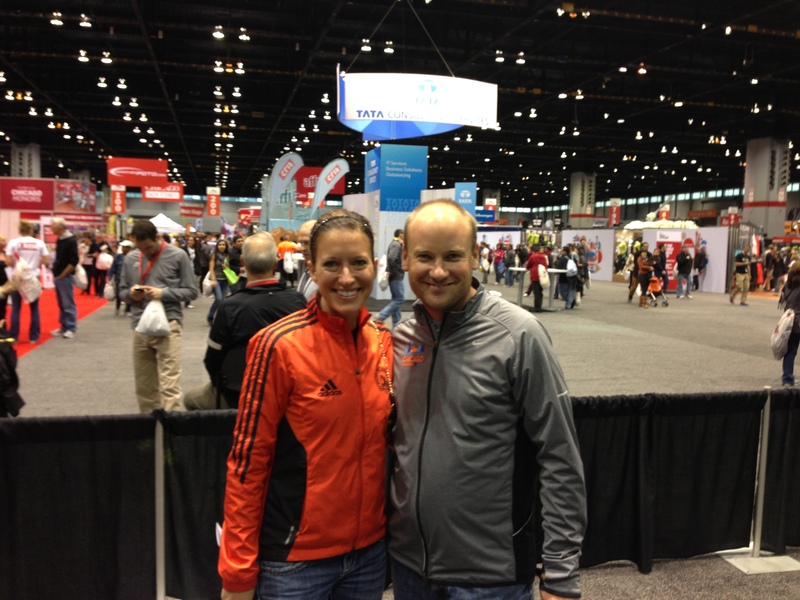 Today was the Chicago Marathon Expo. We had an easy time getting our packets and bags. 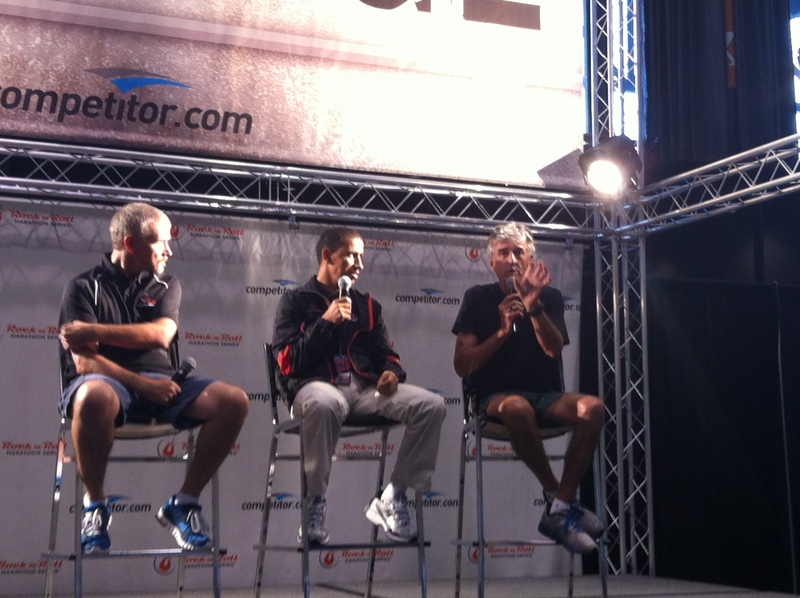 We found out that a “Spirit of the Marathon II” movie will be coming out in March 2013! 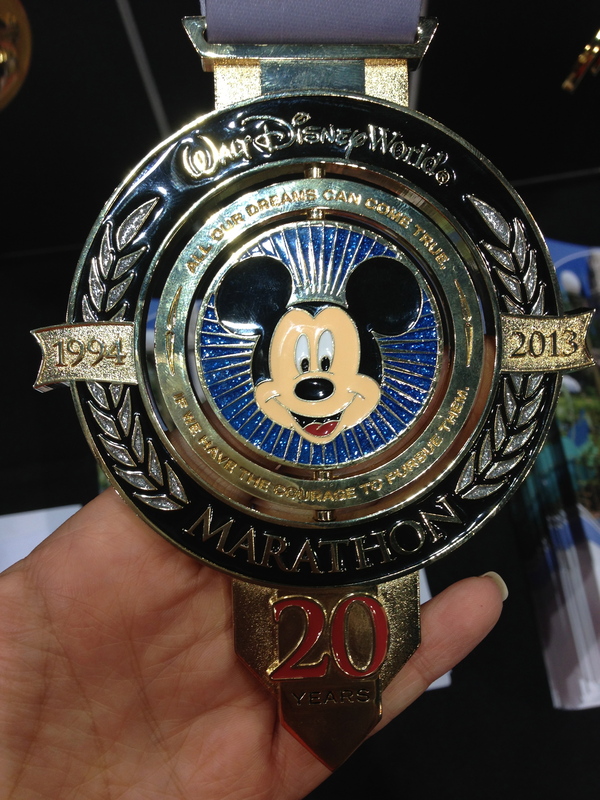 We also went by the Disney Marathon Series Booth and got to see the 20th Anniversary Disney Marathon Medal that we will be getting in 2013! It is so heavy and beautiful! I has two spinners in it! 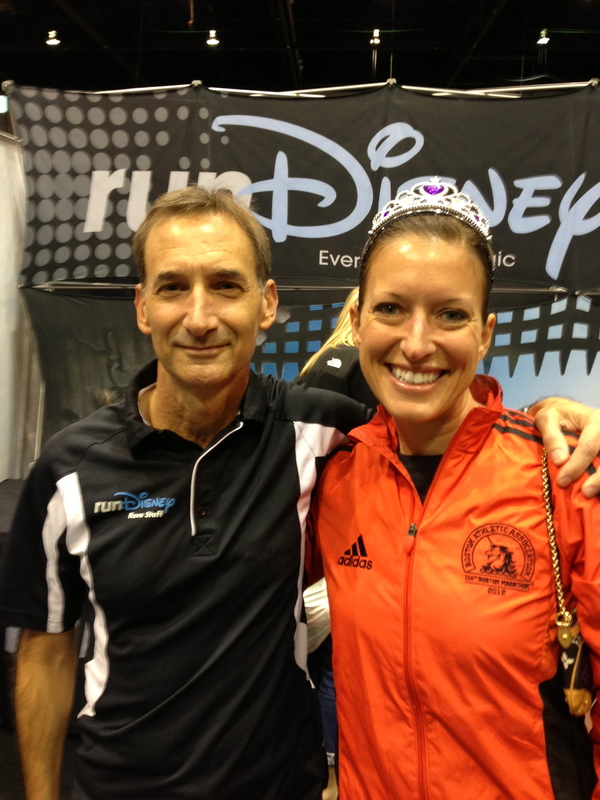 Plus we got to chat with the race director about the event and share our excitement to do the Goofy Challenge. Oh and I scored a princess crown they were giving out for registering. 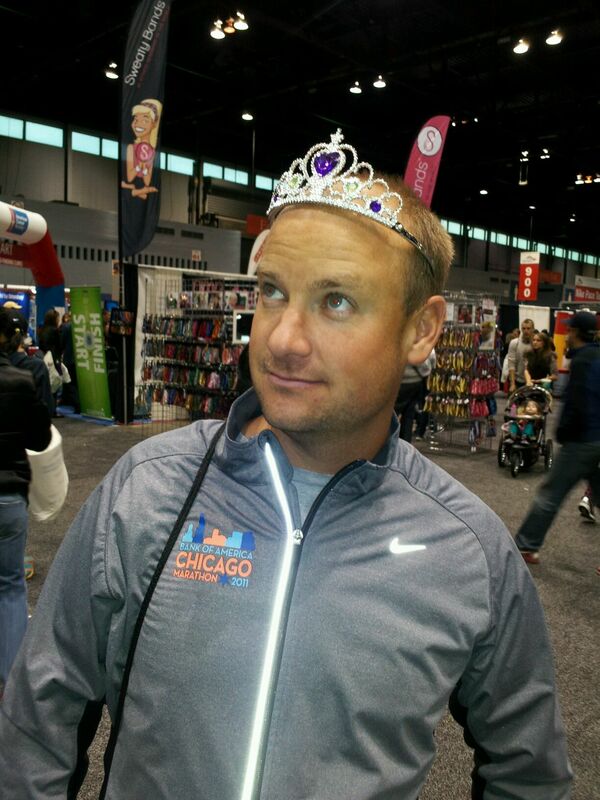 But I have to say Drew did look prettier than me in the tiara. I didn’t love the Nike gear this year so I didn’t buy anything. The colors and choices (no track jacket and the women’s running jacket doesn’t have the side pockets for gels like the men’s) just didn’t stand out to me. I did get a couple more sweatybands and I may be on their facebook page soon sporting a couple bands. It was a successful expo! The temps look mild for Sunday. Hopefully we have a great race day! 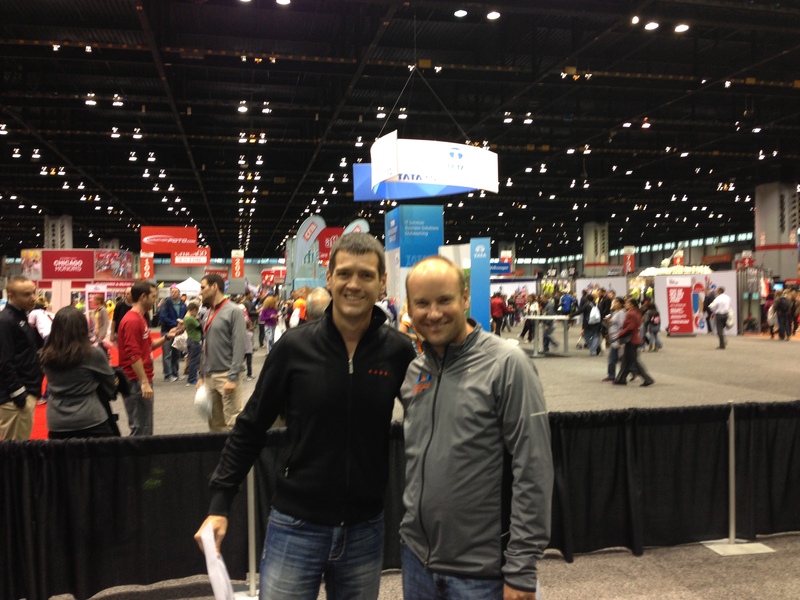 Categories: Chicago Marathon, Expo, Marathon | Permalink. Friday Rob and I left work early to hurry up and pack to get to Drew’s house. We drove up to Davenport, IA to grab our packets for Bix7 that would be the next morning. It’s a small expo with some booths for shopping. We didn’t need anything so we were quickly in and out with our stuff. 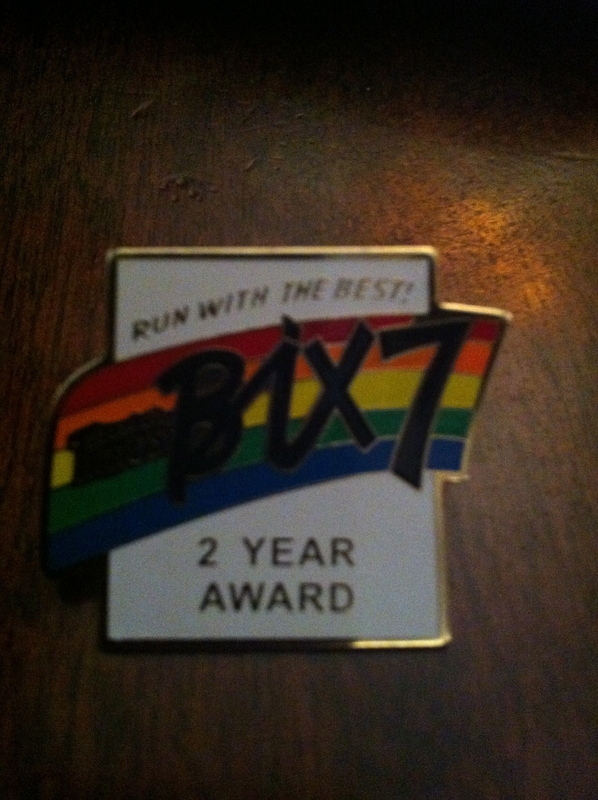 What’s cool about Bix7 is they have commemorative pins for milestone years of running this race. They start at year 2 so we got our first pin. Our next pin opportunity will be at 5 times running this race. Have you run a race with a commemorative pin for the years of running that race? I can’t say I’ve seen this anywhere else yet, but I like the idea! We ate dinner and walked around the festival that was going on in the downtown area. 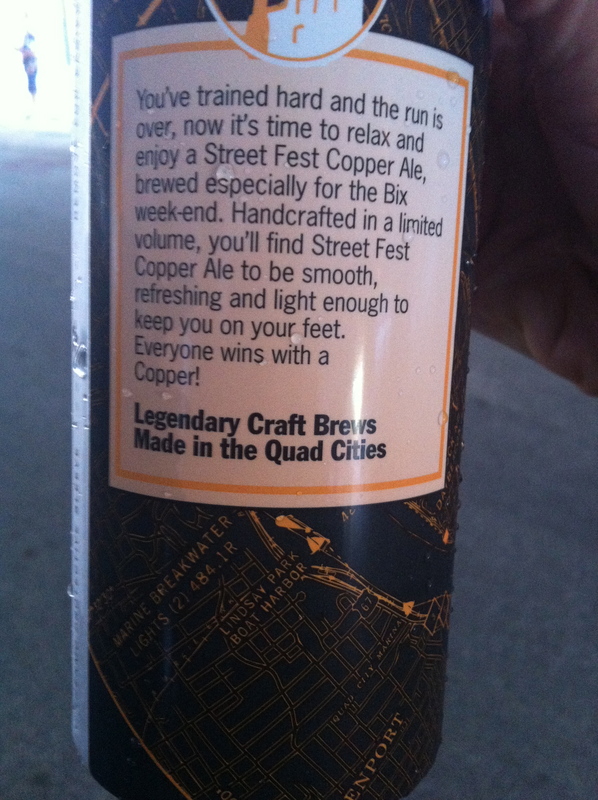 We found out that Bix even has its own beer brewed for the events occurring that weekend! I’ve only heard of custom beer for an event for the Boston Marathon, from Sam Adams. 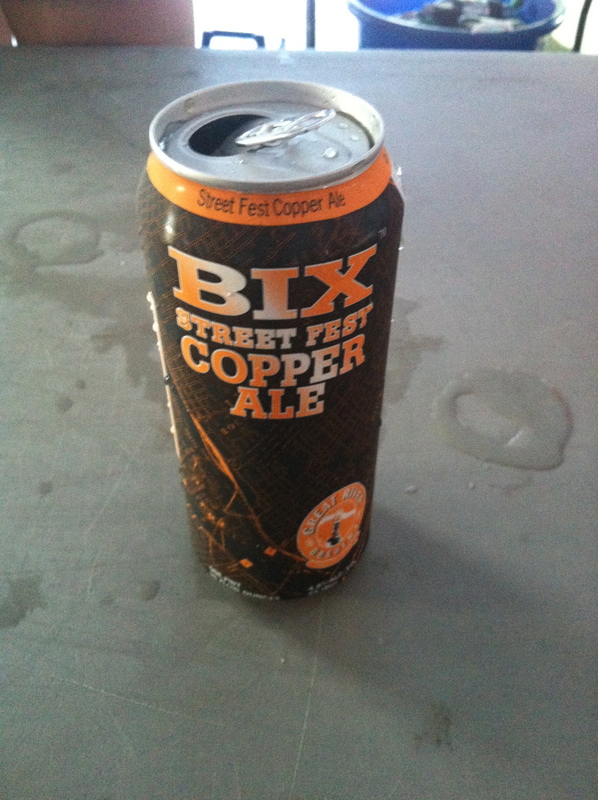 Rob gave the Bix beer a try and he said it tasted similar to a New Castle. It wasn’t his favorite, but it was worth a try. Also, another nice race event touch. Saturday I got in a run outside at home then we packed up the car to head to Chicago for the weekend. 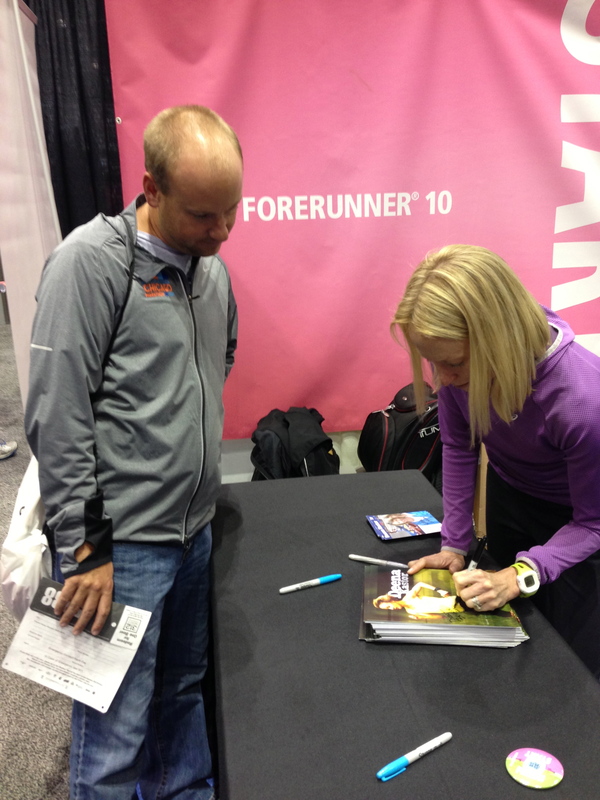 The 2012 Rock and Roll Half Marathon Expo was easy to navigate as with most RNR events and we got our packets and shirts with no problem. Once again, the RNR tech shirt is white. I’m still not a fan of white tech shirts as they seem to get dirty easily and I just don’t think it’s flattering when they get wet from sweat and water. We caught a glimpse of Biggest Losers, Dan Evans and his mom, Jackie Evans promoting getting active and staying healthy. It was a relaxed day and we were in bed early. Unfortunately the race itself didn’t go well for me, but more on that in the next post. 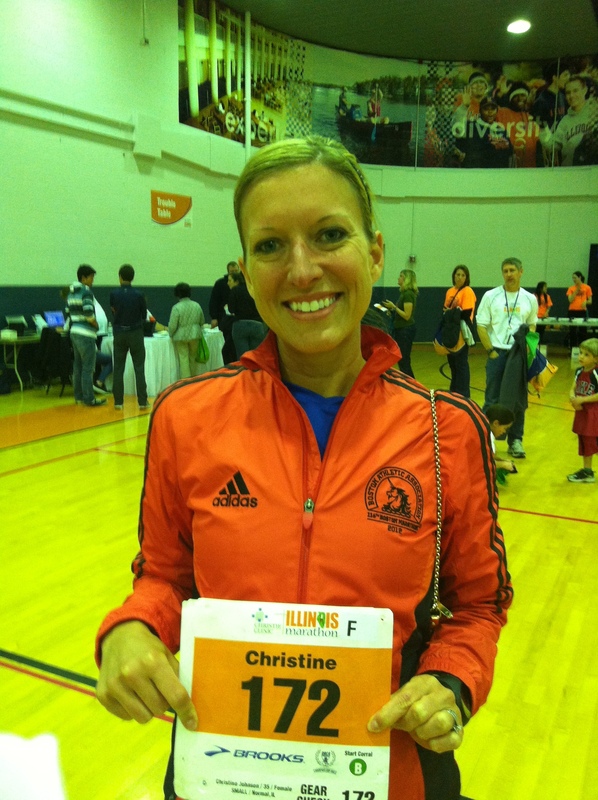 Categories: Expo, Half Marathon, Rock and Roll Chicago Half Marathon | Permalink. 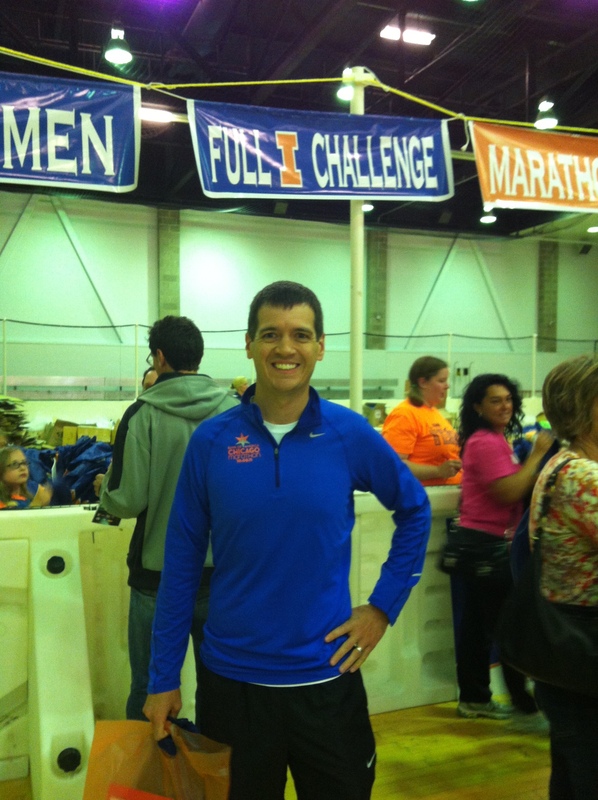 Today after work Rob and I had to get to Champaign, IL to go to the IL Marathon expo and run the 5K. Tomorrow morning is the marathon so this was a first. When to eat the night before a marathon when you have a 5K at 6:45pm and then won’t be back home until 8:30-ish. 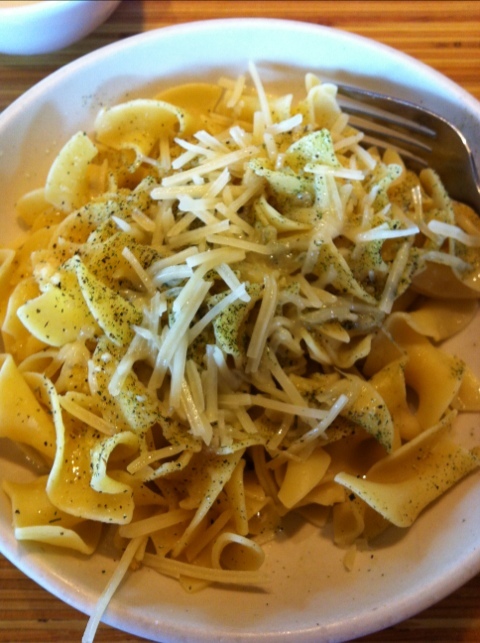 That resulted in Noodles & Company side salad with fat free dressing and regular buttered noodles at 3:00pm. I have no idea if this is the right route, but we usually eat at 4:30-ish the night before a marathon so we will try this and have a light post-5K snack. 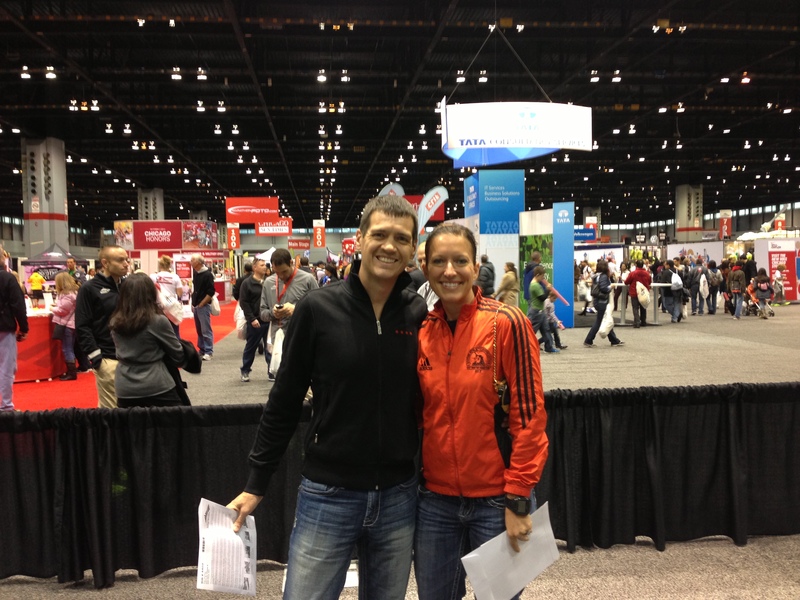 We were down to the expo in more than enough time to pick up bibs and shirts. I managed to spend a couple bucks on headbands at the expo. Then we headed back to the car to wait. 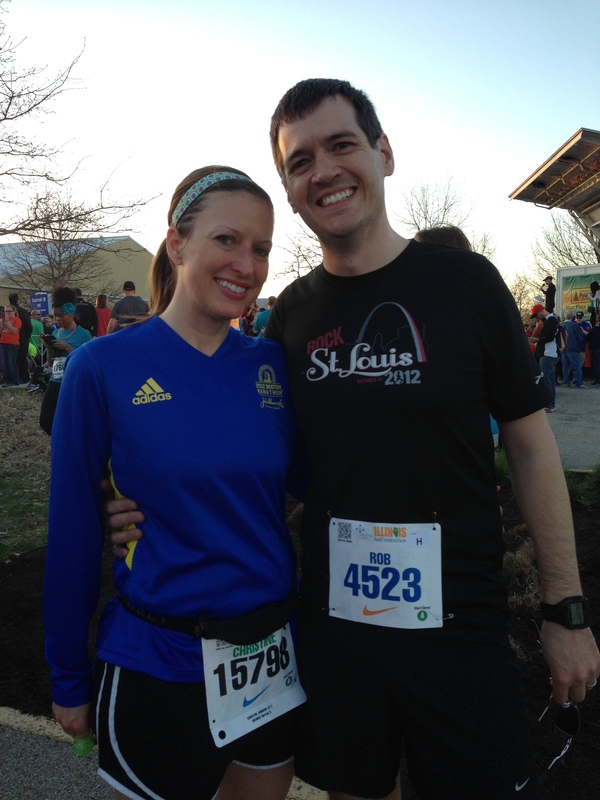 I used the time to take pics of our running shirts. 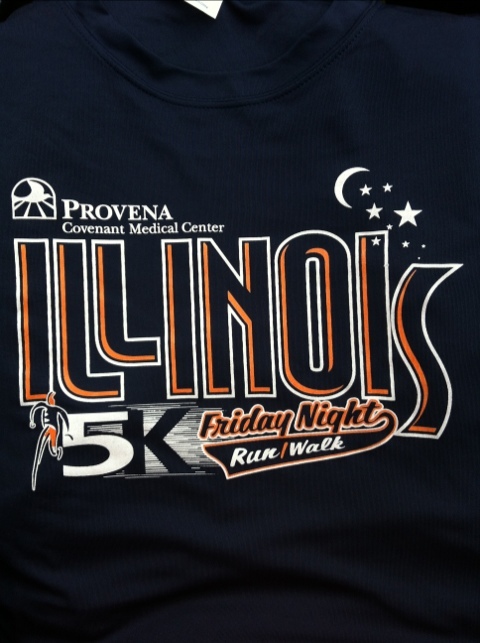 The 5K shirt. General guy’s fit for this one. 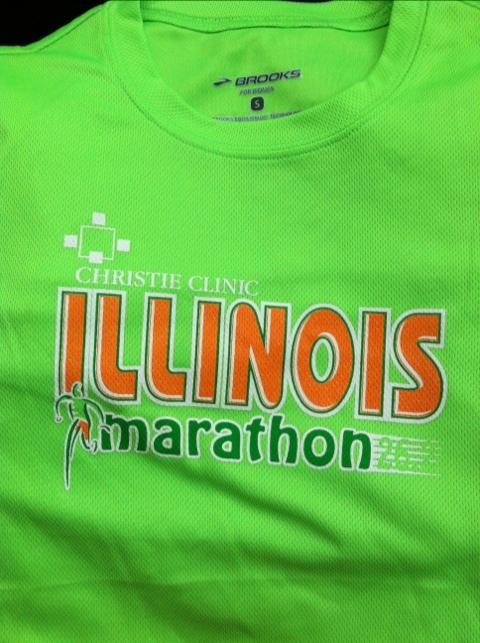 The women’s cut marathon shirt. We made our way to the start line in plenty of time. There were approximately 5,000 5Kers registered. 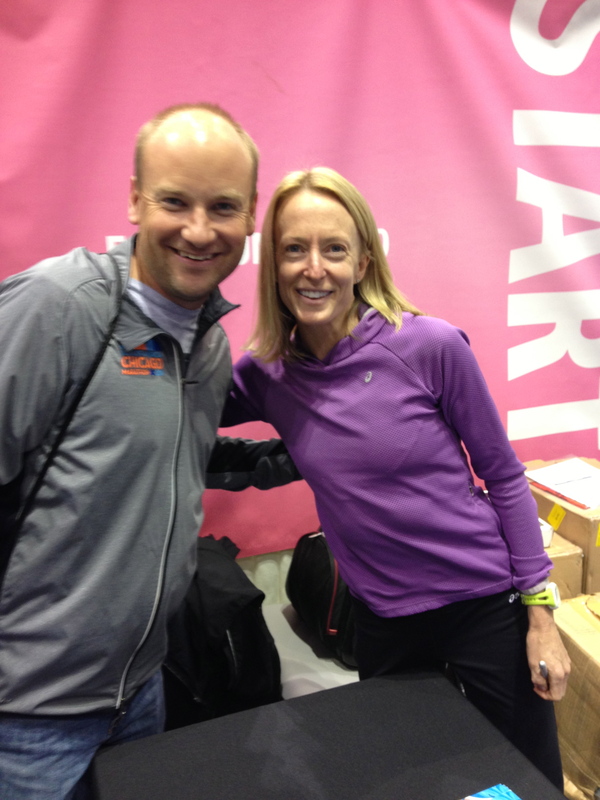 After the race we got to chat with Ryan and Melisa for a bit. 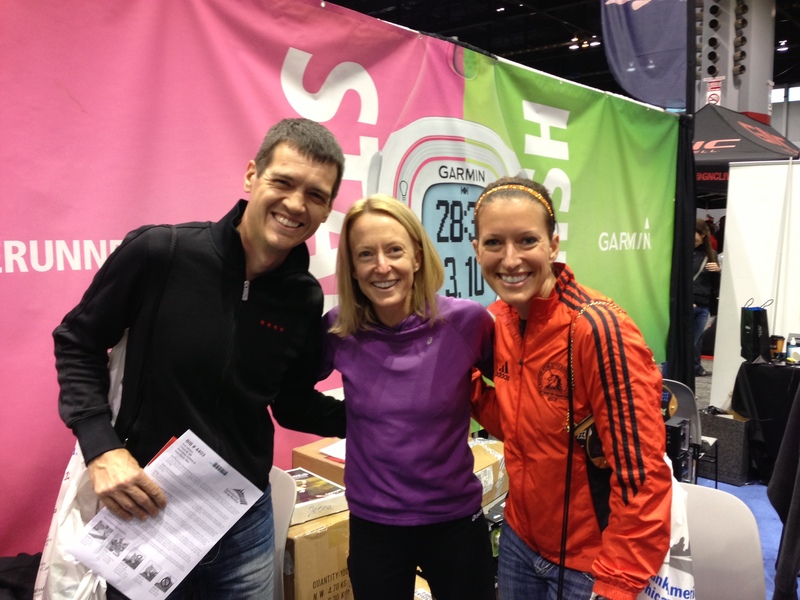 Then we ran into Erin and Mike (who won tonight’s 5K!) so we caught up with them quickly and then got on the road. 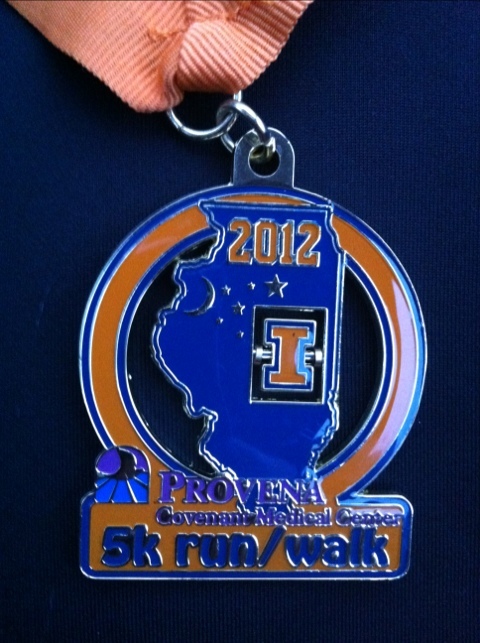 The medal was really nice, the middle “I” spins. Now off to get rest! Categories: 5K, Expo, IL Marathon | Permalink. My Fundraising Page - Please consider donating! Use Refferal Code 184594 to save 15% on your first order!